We went to the local pumpkin patch yesterday and meandered through the corn maze. Now I am claustrophobic and sometimes these corn mazes make me very anxious. My daughters and I let my 12-year-old nephew lead the way. Of course he thought he knew where he was going. We played along going down one dead-end path after another. We marched with 2-year-old Karter and sang songs never letting on we had no idea when and where we would be exiting this maze. We reached the point where it became very clear we were lost and not able to find the exit. My daughter even gave it a try and after about 40 minutes of what started out as fun, I started to become a little panicky. Realizing I was ready to get out but trying to stay calm for the boys, my daughter said, “let’s just go back out the way we came in” as we walked past the entrance path. It wasn’t the success Kaleb had hoped for but with the heat pounding down and Aunt Deanna getting a little anxious, the girls talked him into claiming a “back-handed” victory! As we were walking through the corn maze, following our 6th grade group leader, and trying all these different paths that didn’t lead to anywhere, it made me think of life. Sometimes we get caught up in following the crowd and going into this maze of life thinking we can do it on our own. We start out with Jesus and then we get caught up in the ways of the world. We are seeking for truth and a way out. We go down every dead-end path on our own. We may try paths of things that make us feel better or paths that other people think are the answers out. We try every way out of the chaos except the way that we started. The way we know is right. Jesus is the Way! He is the Way. He is the Truth. And He is the Life. (John 14:6). Whatever maze you are going through today, go back to Jesus and let Him show you the right way. He wants to lead you down paths that lead you right to His plan for your life. Let Him be your leader. I promise you, it’s quicker, easier and less claustrophobic! 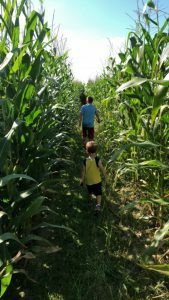 This entry was posted on September 25, 2017 with tags: #cornmaze, #fallfun, #makeadifferenceeveryday, #pumpkinpatch, #vogtfarm by Deanna Young.